Were Hedge Funds Right About Flocking Into MarketAxess Holdings Inc. (MKTX) ? “Value has performed relatively poorly since the 2017 shift, but we believe challenges to the S&P 500’s dominance are mounting and resulting active opportunities away from the index are growing. At some point, this fault line will break, likely on the back of rising rates, and all investors will be reminded that the best time to diversify away from the winners is when it is most painful. The bargain of capturing long-term value may be short-term pain, but enough is eventually enough and it comes time to harvest the benefits.,” said Clearbridge Investments in its market commentary. We aren’t sure whether long-term interest rates will top 5% and value stocks outperform growth, but we follow hedge fund investor letters to understand where the markets and stocks might be going. That’s why we believe it would be worthwhile to take a look at the hedge fund sentiment on MarketAxess Holdings Inc. (NASDAQ:MKTX) in order to identify whether reputable and successful top money managers continue to believe in its potential. Is MarketAxess Holdings Inc. (NASDAQ:MKTX) the right pick for your portfolio? Investors who are in the know are taking a bullish view. The number of bullish hedge fund positions improved by 4 recently. 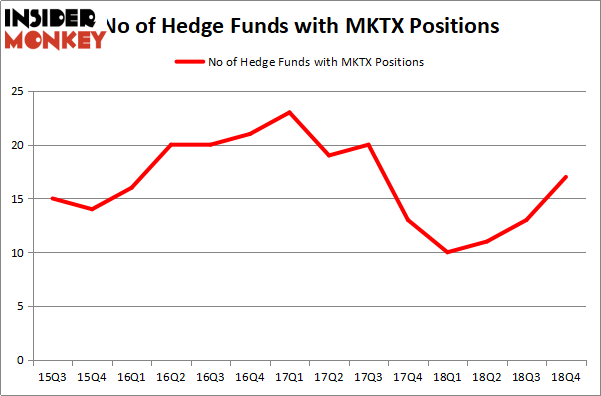 Our calculations also showed that MKTX isn’t among the 30 most popular stocks among hedge funds. Let’s take a look at the new hedge fund action encompassing MarketAxess Holdings Inc. (NASDAQ:MKTX). How have hedgies been trading MarketAxess Holdings Inc. (NASDAQ:MKTX)? At the end of the fourth quarter, a total of 17 of the hedge funds tracked by Insider Monkey were bullish on this stock, a change of 31% from the second quarter of 2018. By comparison, 10 hedge funds held shares or bullish call options in MKTX a year ago. With hedgies’ positions undergoing their usual ebb and flow, there exists a few notable hedge fund managers who were increasing their holdings meaningfully (or already accumulated large positions). According to publicly available hedge fund and institutional investor holdings data compiled by Insider Monkey, Jim Simons’s Renaissance Technologies has the most valuable position in MarketAxess Holdings Inc. (NASDAQ:MKTX), worth close to $78.8 million, amounting to 0.1% of its total 13F portfolio. On Renaissance Technologies’s heels is Arrowstreet Capital, led by Peter Rathjens, Bruce Clarke and John Campbell, holding a $46.6 million position; the fund has 0.1% of its 13F portfolio invested in the stock. Remaining members of the smart money that hold long positions comprise Dmitry Balyasny’s Balyasny Asset Management, Chuck Royce’s Royce & Associates and Cliff Asness’s AQR Capital Management. As aggregate interest increased, specific money managers have been driving this bullishness. Balyasny Asset Management, managed by Dmitry Balyasny, assembled the largest position in MarketAxess Holdings Inc. (NASDAQ:MKTX). Balyasny Asset Management had $14 million invested in the company at the end of the quarter. Israel Englander’s Millennium Management also initiated a $6.6 million position during the quarter. The following funds were also among the new MKTX investors: Richard Driehaus’s Driehaus Capital, Noam Gottesman’s GLG Partners, and David Harding’s Winton Capital Management. Let’s now review hedge fund activity in other stocks similar to MarketAxess Holdings Inc. (NASDAQ:MKTX). These stocks are Interpublic Group of Companies Inc (NYSE:IPG), China Eastern Airlines Corp. Ltd. (NYSE:CEA), Leidos Holdings Inc (NYSE:LDOS), and Packaging Corporation Of America (NYSE:PKG). This group of stocks’ market valuations resemble MKTX’s market valuation. As you can see these stocks had an average of 22.5 hedge funds with bullish positions and the average amount invested in these stocks was $330 million. That figure was $203 million in MKTX’s case. Packaging Corporation Of America (NYSE:PKG) is the most popular stock in this table. On the other hand China Eastern Airlines Corp. Ltd. (NYSE:CEA) is the least popular one with only 2 bullish hedge fund positions. MarketAxess Holdings Inc. (NASDAQ:MKTX) is not the least popular stock in this group but hedge fund interest is still below average. This is a slightly negative signal and we’d rather spend our time researching stocks that hedge funds are piling on. Our calculations showed that top 15 most popular stocks among hedge funds returned 21.3% through April 8th and outperformed the S&P 500 ETF (SPY) by more than 5 percentage points. Hedge funds were also right about betting on MKTX as the stock returned 22.4% and outperformed the market as well. Is Macy’s, Inc. (M) A Good Stock To Buy? 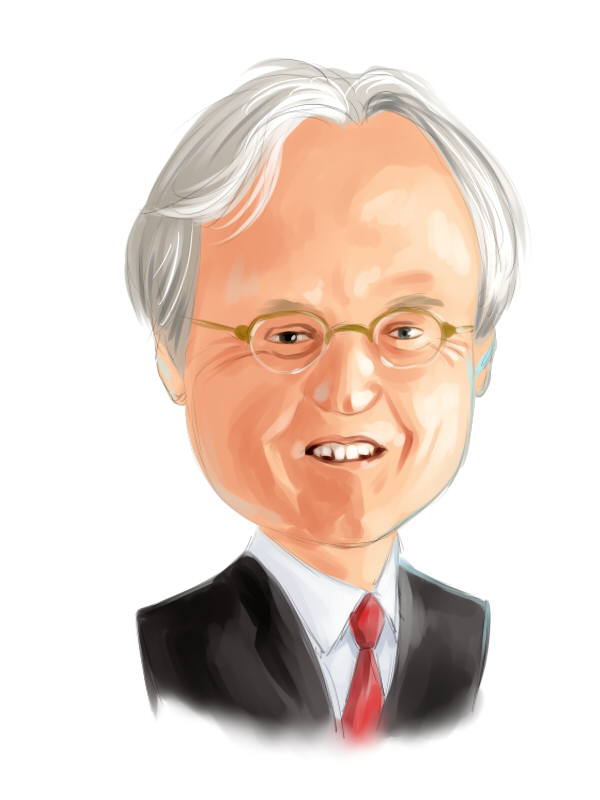 Here’s What Hedge Funds Think About HollyFrontier Corporation (HFC) Wolf Hill Capital’s Q1 2019 Investor Letter Here’s What Hedge Funds Think About Discovery Communications Inc. (DISCK... Did Hedge Funds Drop The Ball On Melco Resorts & Entertainment Limited... Were Hedge Funds Right About Flocking Into HEICO Corporation (HEI) ?